Line a 10x15 inch pan with parchment. Set aside. In the top of a double boiler set over simmering (not boiling) water, heat white chocolate and peanut butter. Stir constantly until white chocolate and peanut butter melts. Spread onto prepared pan. 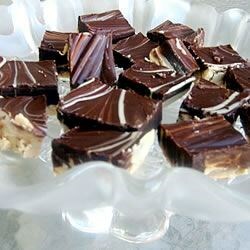 Pour melted semi-sweet chocolate over top and swirl through with a knife, to create a marble pattern. Chill until firm. Cut into 1 /2 x 1" pieces. Learn what’s behind a recipe that comforted family during wartime.